Well, I certainly did not intend for January to get away from me like that, but here we are, several days into February! Between returning to work and starting a new position at a new University and some compounding health issues related to my RA, I fell a bit behind. ow that things have settled down, I'm so excited to get back to blogging and I have a ton of posts lined up, as well as a couple trips planned for the near future (including on to Tampa, thank goodness, because I could use some warm weather!). When I saw this shirt I had to have it, it is just so unique! For those not in the know, this "Anna Mouse" shirt from South Parade features the one and only Anna Wintour, famed editor of Vogue and antagonist of The Devil Wears Prada, wearing mouse ears! Honestly, I have no idea how they got permission to print this shirt, but I think it's wonderful! There is also a version featuring the famous fashion designer, Karl Lagerfeld. 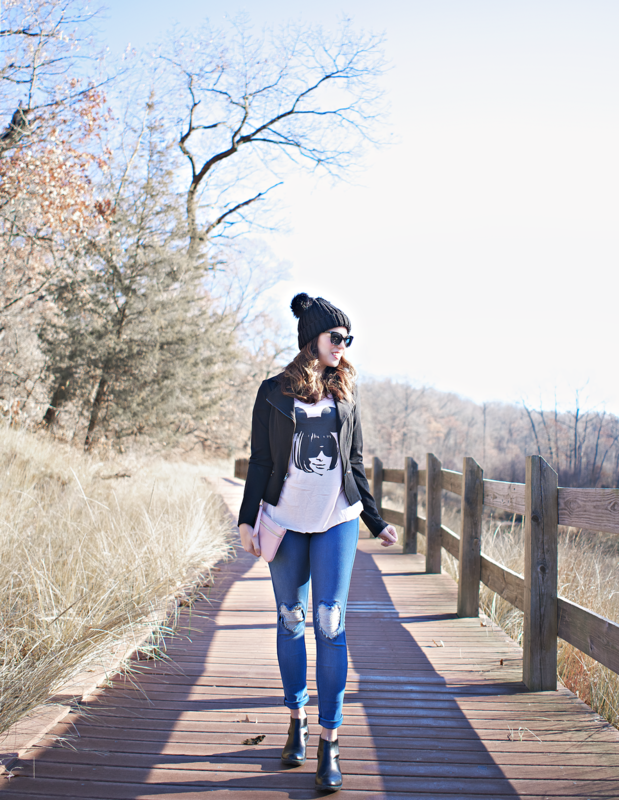 I paired this shirt with a cropped moto sweater jacket from the Beatuy and the Beast Kohl's Collection that came out last year (similar from Old Navy), cute heart leggings from Calzedonia, a double pom pom hat from ASOS (another subtle nod to the mouse ears), Dansko black booties (similar from Joie | similar from Natural Soul | similar from Ecco), and a millennial pink wristlet (it's RFID blocking *and* it has a built in phone charger!). 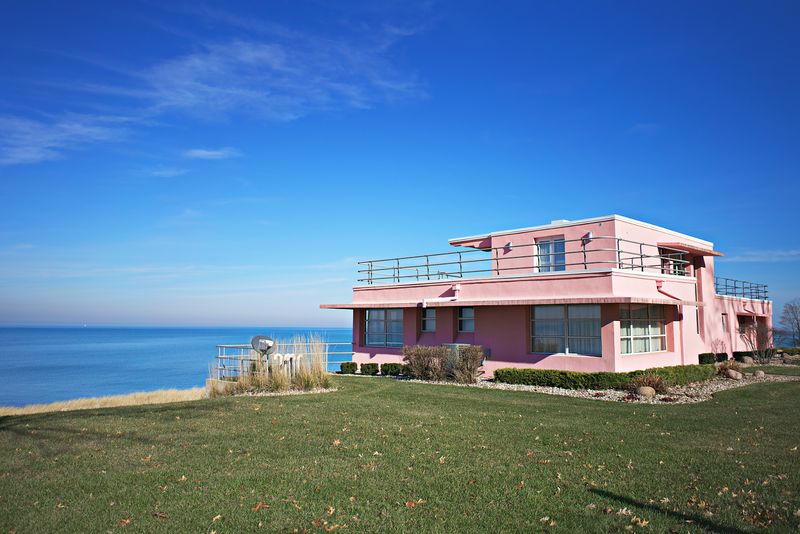 I couldn't believe our luck in spotting this pink house - it's one of the 1933 Chicago World's Fair Century of Progress Homes, located inside the Indiana Dunes State Park. It's like a 1980s Malibu Barbie Dream House! The background of the house is pretty interesting. Each house that was built as part of the Progress of Homes represents a different style and they were built for the 1933 World's Fair. The state could not afford the upkeep of the homes, so they were sold to private owners with the caveat that the homes would have to be open to the public for one month every year. When we went, the homes were not open, but you can still walk around the outside of the property. It certainly made the perfect back drop for this outfit.